rubber parts of vehicles and motorcycles, O-rings, gaskets, bike's braking lining sheets, damper and medical devices, etc. The machine's body is built by a single-piece structure made by spherical graphite organized ductile cast iron material FCD-50. This FCD-50 material will apply high tension/compression strength that can thus make the user ignore the concern of body's deformation. The piston shaft is made by CR white cast iron with precise finish grinding to keep it highly accurate. And the heating disc is under a heat-treatment plus delicate-grinding process that makes its surface hardness reach the level of HRC50-55. 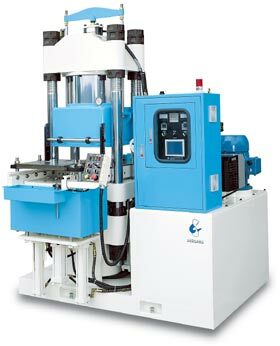 The machine's main system can be lifted up rapidly, with two-stage pressuring up to add pressure slowly. It has a self-compensating design that will ensure product's quality. he friction-free design between the mould's in/out motion and heating disc surface can guarantee the product's surface precision. It can set up the exhausting cycles & length and heat-hardening time freely. As well as to set up the second exhausting and forced pressuring time. This machine applies PLC programmable system to perform controlling task. The output is 24V/DC, free-of-contact. The electrical system is exactly same with the injection-molding machine that can sustain long operating life. Client can select the touch-operating type monitor and connect it with PLC system to build up a comfortable and smooth operating interface. The proportional hydraulic-controlling system allows the operator to set up and modulate the flow percent and pressure on the touch-operating monitor. The setting value can be varied according to various mould sizes and products.